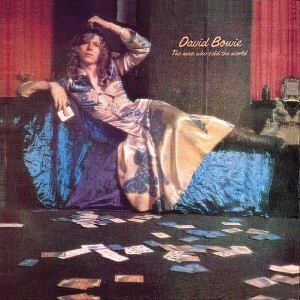 In April 1971 David Bowie released his third UK album The Man Who Sold the World on Mercury Records. This would start the classic period of Bowie’s career featuring the line up Mick Ronson, Trevor Bolder and Woody Woodmansey, that would later become the ‘Spiders from Mars’. For the cover of the album Bowie embarked on a challenging new idea and concept. He was photographed luxuriously reclining on a day bed which is draped in shimmering blue silks and satin, wearing a ‘man’s dress’ of cream velvet covered with blue Art Nouveau flower designs. The dress hugs his figure accentuating his curved hips, open chest and long legs. He wears tight leather knee-length boots which would normally be worn by women. His hair is long, curly and shoulder length, while his arm is raised to adjust his fedora hat. His other hand is limp in which he holds a single playing card, while the remainder of the pack lies strewn across the floor. The room in which he luxuriates, has an echo of Victorian splendor with its red curtains and opium den decadence. The dress he wears was designed by British fashion designer Michael Fish, who also created Mick Jagger’s white dress for the Rolling Stones free Hyde Park concert in 1969. The cover to The Man Who Sold the World offers an early indication of David Bowie’s explorations with his androgynous appearance and playing with sexual ambiguity. The cover of the album was so provocative and challenging at the time that it was changed for its United States release to a cartoon by Mike Weller depicting a man with a shotgun under his arm standing outside a mental asylum (Bowie’s brother was receiving treatment in such an institution at the time). In 1972 it was replaced on world-wide release with a rather dull black and white photo of Bowie kicking his leg in the air. Looking deeper at the ambiguous image on the original Bowie album cover is interesting. The word ambiguity comes from the Latin ambiguus meaning ‘having double meaning, shifting, changeable, doubtful’ . I feel this gives us a clearer sense of why the album cover proved so controversial. David Bowie deliberately set out to shock the viewer by exploring and playing with themes of cross-dressing, sexuality and gender. Some people may have found the image attractive and alluring, others disturbing and repulsive. But the main point is like any great piece of art, it provoked a response. The Jungian psychologist James Hollis says that the spiritually mature person is able to be with the 3 ‘A’s: Ambivalence, Ambiguity, and Anxiety. He says they do not look to a black and white simplicity or dogma, but are able to live a meaningful life within the complexities that life offers. We may be some way off from being able to be accepting of Ambivalence, Ambiguity, Anxiety in our lives, but I feel any attempt to open to these aspects of life can only lead to a more creative engagement with ourselves, others and the world we live in.